Music has always been an integral part of the holiday season. As everyone knows, there is no better way to celebrate than with song. Re-live your childhood memories & share your love of music this holiday season with It's Time For Christmas from Santorella Publications arranged in Piano Vocal (PVG) format by Jonathon Robbins. This wonderful title features an assortment of all your favorite songs including those unforgettable Johnny Marks tunes from the animated television special “Rudolph the Red-Nosed Reindeer”. 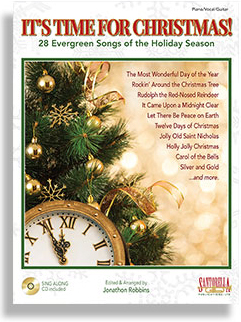 You'll thoroughly enjoy this collection of the 28 most requested holiday favorites arranged for piano, which includes a sing-a-long CD.